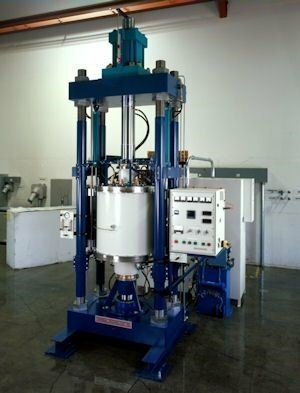 Thermal Technology's hot press systems are designed for simultaneous application of high temperatures and high pressures. 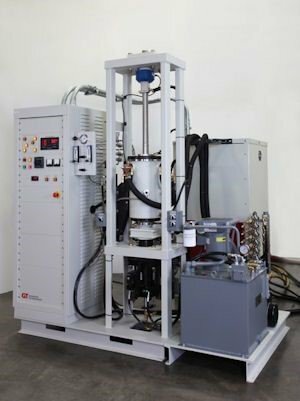 Primary applications include densification of powdered materials, diffusion bonding of solid components and processing of fibrous composites. 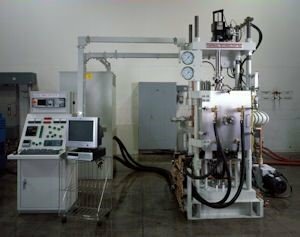 Each Thermal Technology hot press system is supplied complete with vacuum chamber, hydraulic press and frame, graphite hot zone, power supply, mechanical vacuum pump, and a programmable control system. Available options include interchangeable hot zones, high vacuum pumping systems, data recorders, hot ejection and load cells. Certain hot press furnaces can accept four different hot zones which are easily interchanged. All internal components (including heating elements, insulation and power feedthroughs) are mounted on the front and rear vacuum chamber doors. To change zones, simply disconnect the power leads, remove the doors from their hinges and replace with alternate door/hot zone assemblies. Both doors and the main chamber are fabricated from double-walled carbon steel with internal baffling for efficient water cooling. Stainless steel doors and chambers are available for areas with poor water quality (which could accelerate corrosion) or when the ultimate high vacuum performance is required. 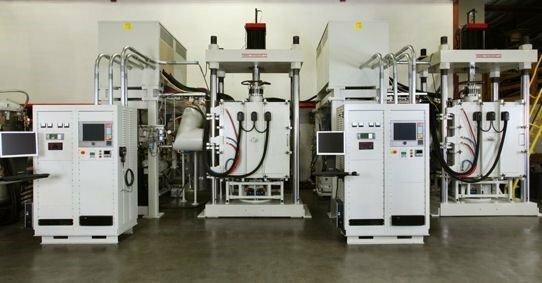 Two diffusion bonding hot presses operating at 1450°C with a total force of 100 tons. The 24" x 24" x 30" molybdenum hot zones capable of diffusion bonding multiple parts in one load. Each system footprint measures approximately 9 ½' wide, 15' deep and 12½' high.